If you’ve been looking for some inspiration about how you can start growing fresh herbs this fall, then indeed it’s time to have your kitchen herb garden. These herbs are an excellent addition to your recipes, by tossing a few sprigs; you can make a sweet and savory meal. This aromatic application makes a delicious meal that your neighbor will be dying to taste. This guide will assist you on how to get started on design and installation of your indoor kitchen herb garden. Choosing a location for your garden should be your priority. This is the thing; making it closer to the kitchen will offer easy accessibility without straying too far to acquire some. The closer to the kitchen they are the easy reach it will become; otherwise, you will not enjoy them as often. Secondly, about location, they should enjoy the natural light from the monster source (sun). We all are aware that plants use sunlight to grow healthy, so, even when you grow them indoors, make sure there is sunspot. However, if you cannot achieve this expectation, try to use additional fixtures to ensure enough light gets to your garden. You don’t do need to do a complete kitchen remodel to make this happen. Like most crops, having suitable soil for your herbs should not be neglected. Herbs have this tendency to do very well on free-draining soil, like sandy. They don’t enjoy keeping their feet wet for long. Clay soil is not on the preference list; however, if you can add some compost and grit, it can loosen up to impact on drainage. Make sure you identify the varieties that can thrive in various soil structures comparable to the one available so quickly. Basil, cilantro, and dril enjoy moisture-retentive soil while rosemary and lavender will do well in poor soil. This should be conversant with the food you most enjoy. Take your time and have a list of foods you enjoy and the kind of herbs used for various dishes. For the case, if Italian foods, Basil, Parsley, and Oregano are appropriate; French favorites, Tarragon, Parsley, Chervil, Coffee and Chives and many others. The list is endless, so, you can start with a few pairs and eventually, you will expand your reach to the rest of your selected herbs. Are you going to prefer pots, containers or planters? Depending on the room required for continuous growth of a specific herb, you should not create room for a fail. That said, a pot is convenient for herbs that need plenty of room and no disturbance from other plants. Also, containers are suitable if you wish to relocate a particular variety from its family. If the specific herb is flowering, showcasing it o the walkway may be an ideal location to appreciate its fragrance and blooms. Sometimes, it is good to combine herbs with some pots of flowers to enhance the visual appeal. This is done when the herbs are still in their early growing stage. Planters are a great invention if you position your garden in a place where sunlight is scarce; therefore, you may need to shift your herbs to get some more sun regularly. This idea is brilliant for those of you who have no trouble with daily routines. 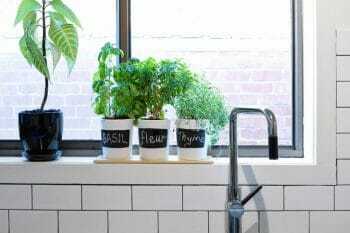 Kitchen herb garden is a great invention and adopting it in your home will help you a bunch. This guide will ensure you make the right set-up and for any inquiry or success in your project, give us a notice in the comment section. Good Luck!